The delicate, tart oaky notes of this third release are laid down in lock step with the wild pear flavors from the brett duet for a harmonious sensory experience. Each sip reveals a new beat, enticing you to take another. 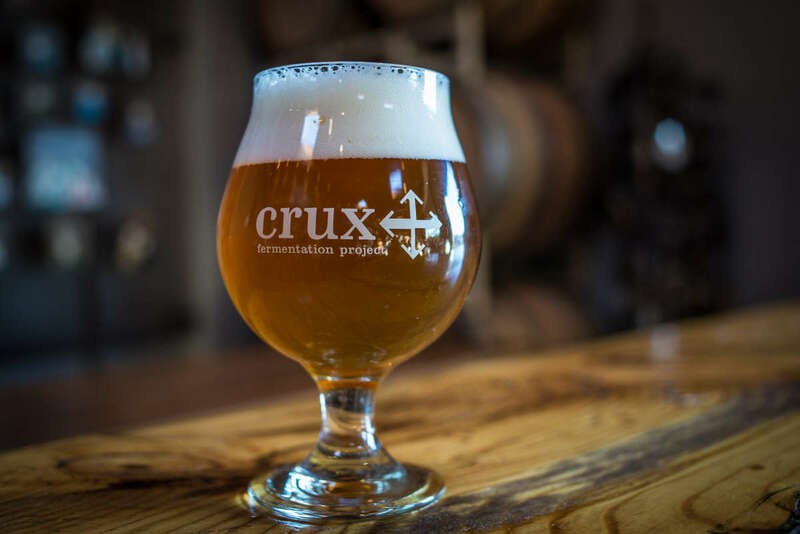 We’re Crux Fermentation Project— housed in a former AAMCO Transmission Plant and inspired by our location right in the heart of Bend, Oregon. Our brewery is a one-of-a-kind, built for non-traditional brewing methods like decoction mashing, open fermentation and barrel aging, and for leveraging the limitless possibilities that wild yeast strains and experimental hops present. Our tasting room is right in the middle of our brewery, partly because that's all the space we had left— but mostly because we wanted to give you the opportunity to experience the sights, sounds and wonderful aromas of the craft brewing process. We may be a bit hard to find, but we're right smack in the middle of Bend, Oregon. Take the road less traveled and brave the "Private Road" and "No Outlet" signs— you'll be rewarded with 20+ original craft beers on tap and an expansive panoramic view of the Cascade Mountains which at dusk hosts Central Oregon's most incredible sunsets.